Having beauty OCD means that when I fall for a brand, I tend to fall for it fast and hard. 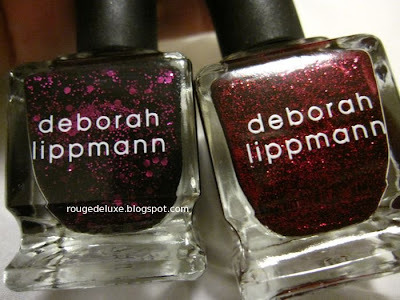 That is how I ended up with a new stash of Deborah Lippmann Luxurious Nail Colors. 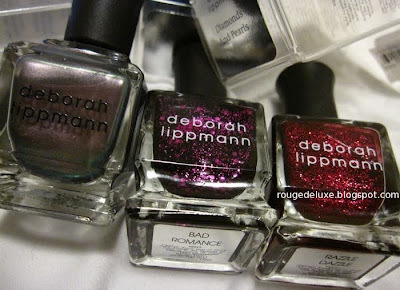 The go-to manicurist for many celebrities, Lippmann recently did Lady Gaga's nails in Waking Up In Vegas for the latter's Vanity Fair cover. Made in the USA, Lippmann's nail polishes are free of formaldehyde, tuolene and dibutyl phthlate. Instead, they contain aucoumea, biotin and green tea. 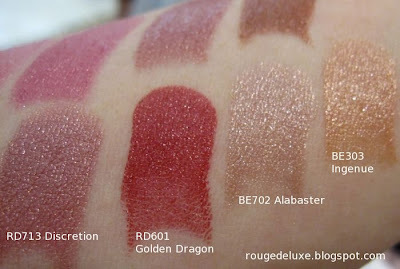 The glitter-infused shades usually retail for US$18 while the non-glitter shades are US$16. 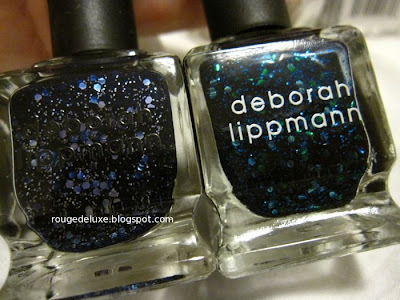 Below: Bad Romance (left), Razzle Dazzle. Evonnz has excellent swatches of Bad Romance. 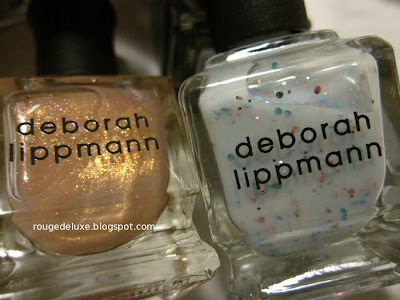 Diamonds & Pearls and Glitter In The Air (new for spring 2011). 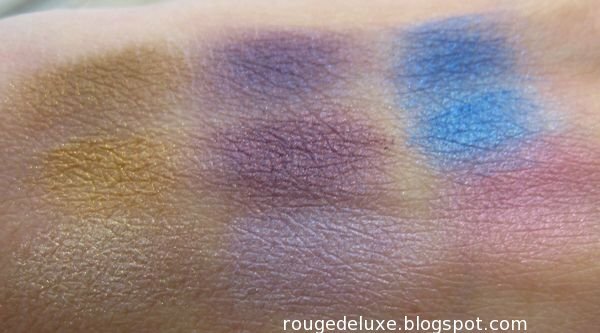 Here are some quick swatches of Across The Universe without any top coat. 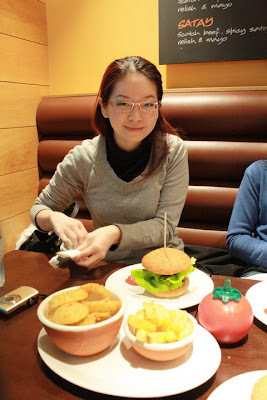 Karlasugar has a guest review on it. 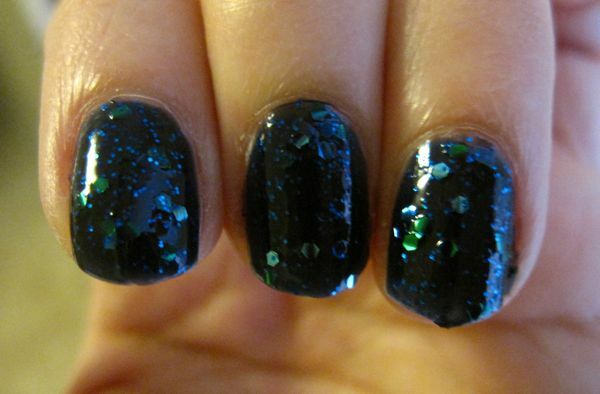 It takes 3 coats to achieve opacity. What I loved about Across The Universe was the dimensionality of it. 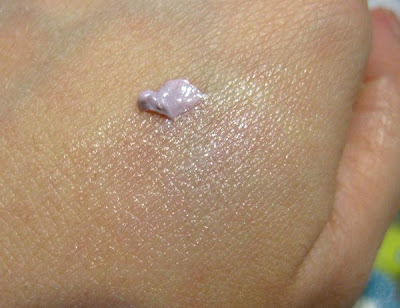 The small glitter flecks and hexagonal glitters appear suspended at different depths. 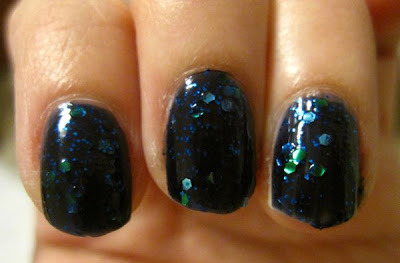 The hexagonal glitters reflect light blue and emerald against the midnight blue base. The Lancome Maqui Miracle Foundation SPF35 PA+++ is set to debut at all Lancome counters in Singapore on 1 March. Since receiving it a couple of weeks ago, I have been wearing it almost every day. The concept and technology behind Maqui Miracle have already been explained in an earlier post so I won't repeat it again. 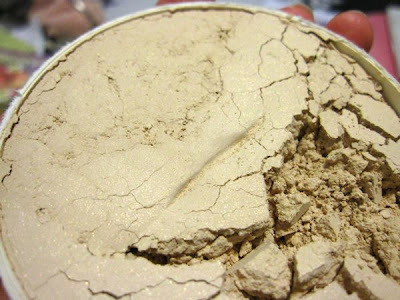 Most makeup artists prefer liquid foundations over powder foundations as the former provides a more flawless, natural finish. 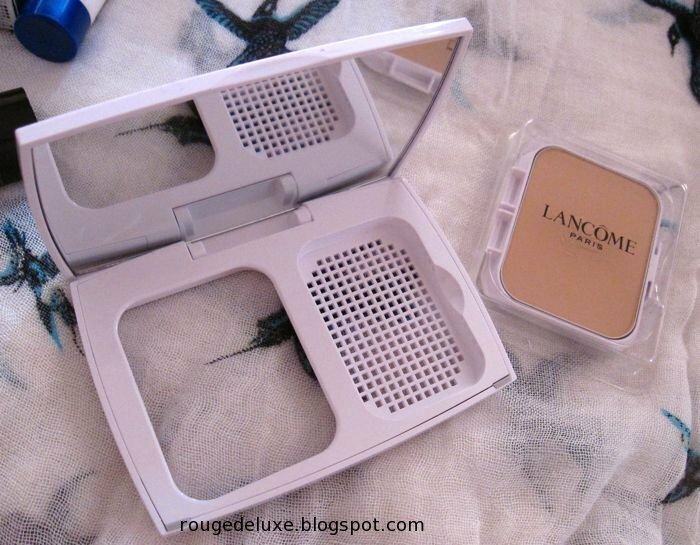 Personally, I've always found powder foundations to be more user-friendly in terms of application. A really good powder foundation can be applied in less than 20 seconds whereas liquid foundations tend to take more time to blend. Hence, when I'm in a rush, I always reach for a powder foundation as it takes just a few swipes, blend and I'm done. 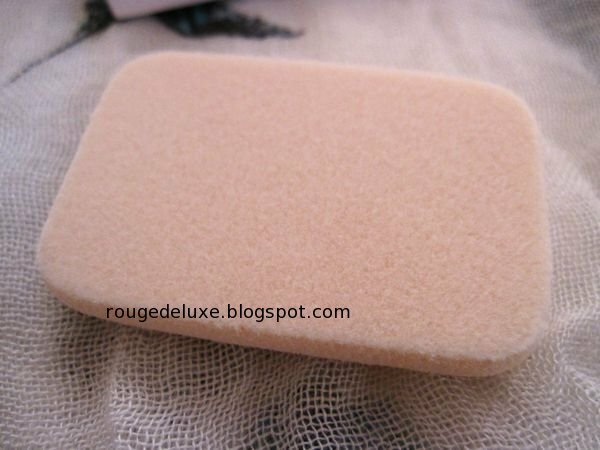 The included sponge has a velvety side that is supposed to be used first to apply the foundation, followed by the other side to blend out for a flawless finish. Personally, I found the velvety side to be sufficient for achieving a smooth seamless finish and it was also better at applying the foundation than the non-velvety side. Maqui Miracle impressed me with how it applied very smoothly and evened out my skintone while minimising the appearance of my pores. 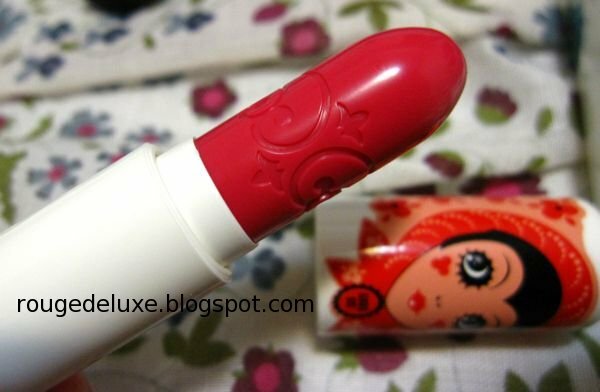 The shade O-01 was a perfect match for me and helped to cover up the redness in my skin, making it look fairer. (I use O-03 for Teint Miracle.) It also wore well over more than 12 hours of wear without oxidising. In Singapore's hot and humid climate, I found myself having to blot every 2 hours but in London's dryer winter climate, I had to blot every 4 hours. 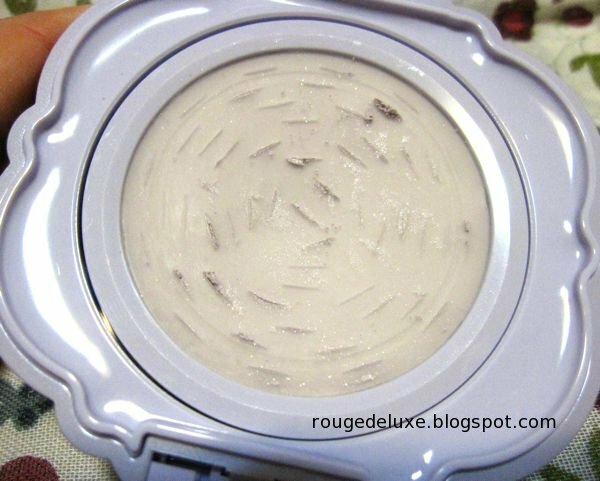 Compared to Teint Miracle, Maqui Miracle provided better coverage and oil control but some ladies may prefer Teint Miracle's more natural finish. 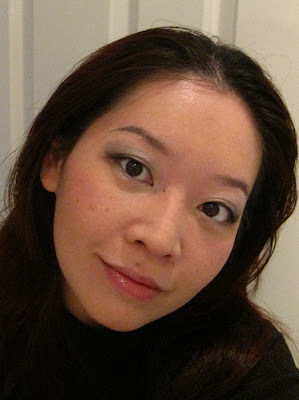 In the photo above, I'm also wearing the Lancome Ultra Lavande Cold Harmony eyeshadow quad and L'Absolu Rouge #180. The photo above was taken in Singapore while the photo below was taken in my brother's house in Reading in the UK. 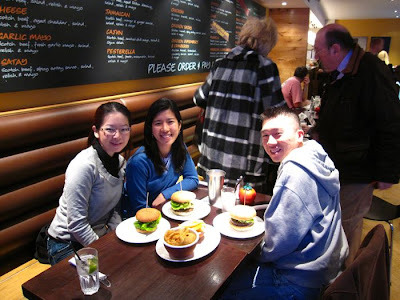 Here's another photo taken by my brother when we were in Windsor, about to tuck into the BBQ burger at Gourmet Burger Kitchen! 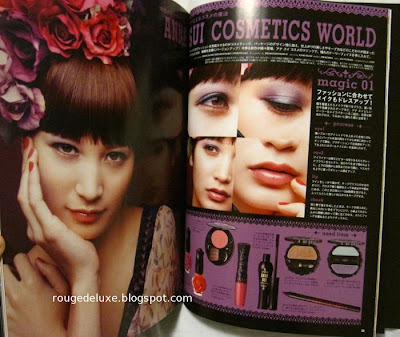 Do also check out the reviews of Maqui Miracle on Makeup Blogette, Hitting The Pan and Women Love Beauty. If you are interested in the foundation, do visit any Lancome counter for a foundation consultation and two-minute Aura-Bright Flash Touch Up. There is also a special Perfect Aura Makeover event taking place at Raffles City from 2-7 March, just see the Lancome website for more details. 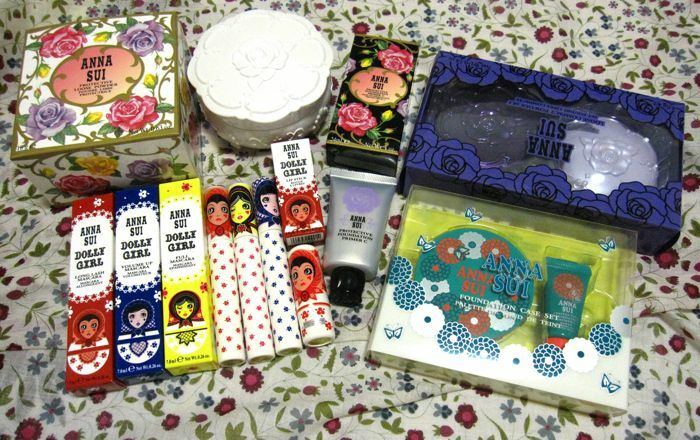 Anna Sui will release two limited edition Eye Makeup Sets (3675yen each) on 7 April in Japan. 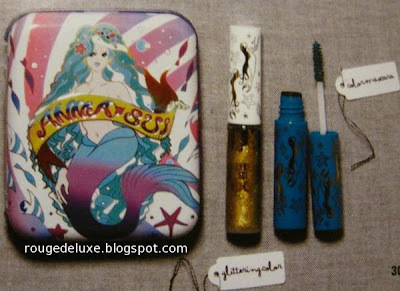 Each consists of a glittering eye color that can also be used on the lashes, and a color mascara inside a mermaid-theme case. 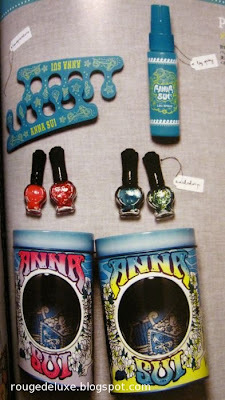 There will also be a new Double Eye Color in 8 shades and two limited edition Pedicure Kits (4725yen). Each Pedicure Kit includes two limited edition nail polishes, a leg mist and toe separators packaged inside a can. The latest Anna Sui mook celebrates the 15th anniversary of the label's debut in Japan. 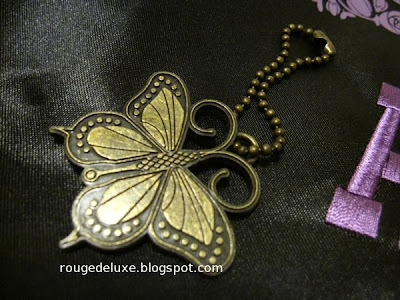 It includes a large tote bag measuring 40x29x12cm and a bronze metal butterfly charm. 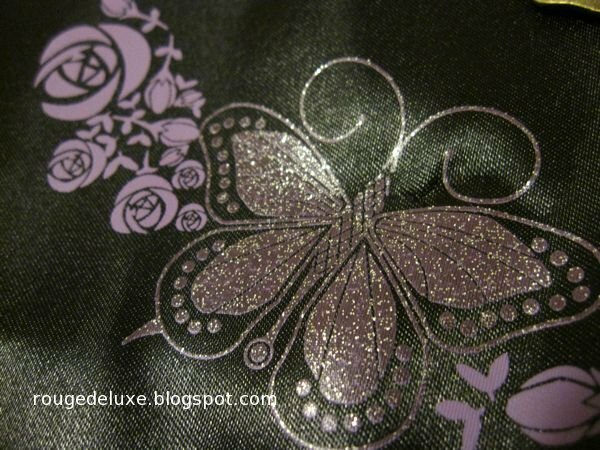 The bag is made of polyester and has a slight sheen. 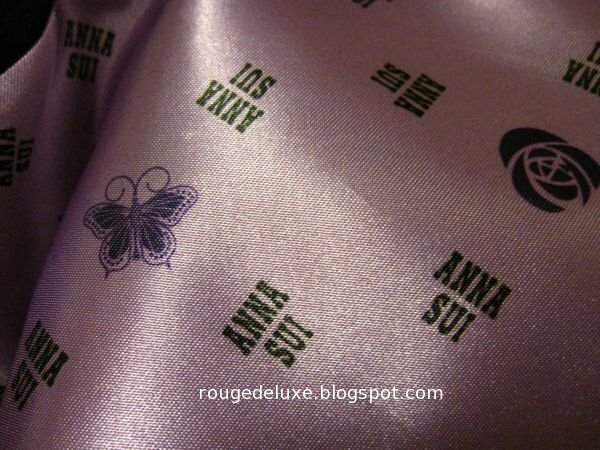 On the whole, the bag is quite well-made and I liked the black/purple/bronze combination as well as the stitched Anna Sui logo. The large butterflies and roses on the bag have a sprinkling of silver glitter. 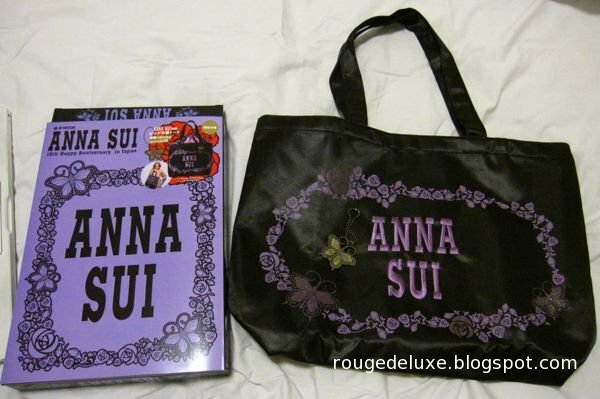 The top of the bag has a drawstring inner apron that can be used to close up the bag. The bag is very roomy and can fit a few A4 size magazines. 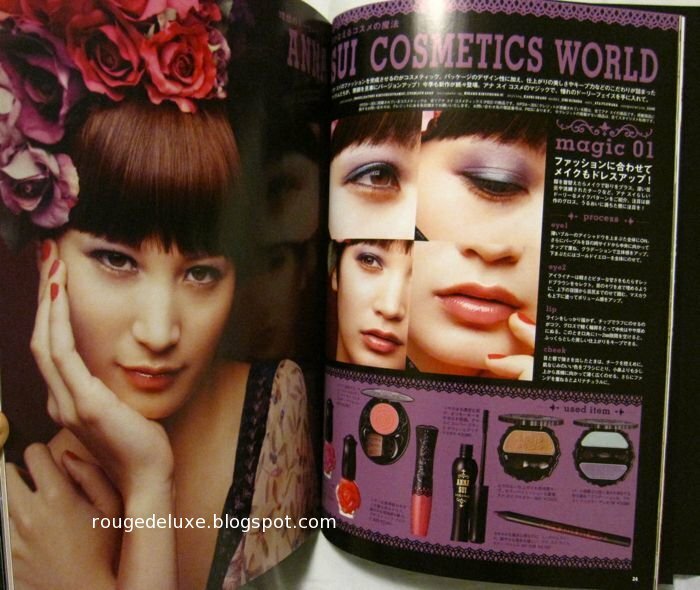 The 83-page mook offers an in-depth look into the designer's clothing, accessories and beauty lines. The designer also provides a rare tour of her home. Anna Sui accessories that will be available at Isetan Shinjuku's Anna Sui fair from 27 April to 3 May. I'm seriously lemming the Bear Brick (1575yen)! 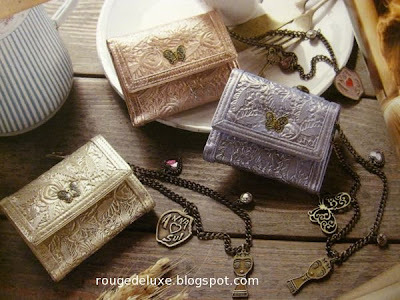 I also love these wallets (12600yen) which have a romantic Baroque feel. 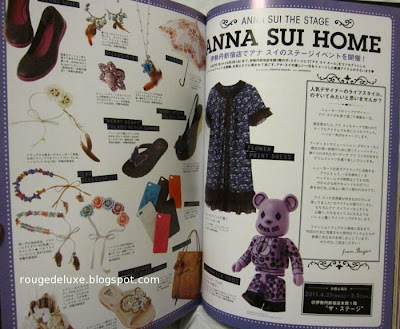 Anna Tsuchiya modelling the spring fashion collection. 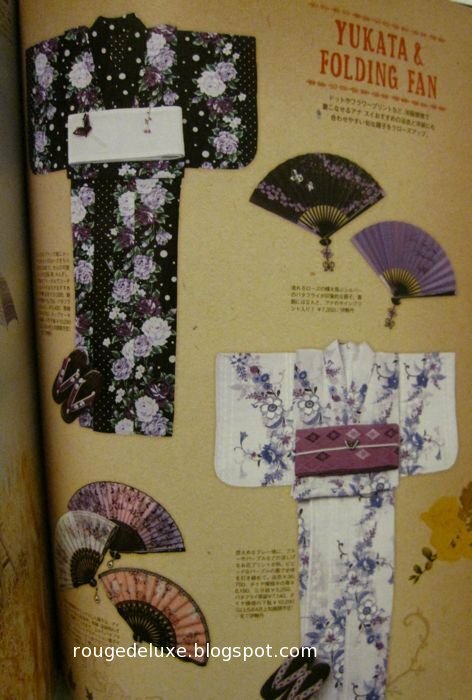 Anna Sui kimonos and fans. The Shiseido Spring 2011 makeup collection has just launched exclusively at Robinsons Raffles City. It will be rolled out to other counters in Singapore next Friday. The collection is an eye-catching rainbow of vibrant shades. 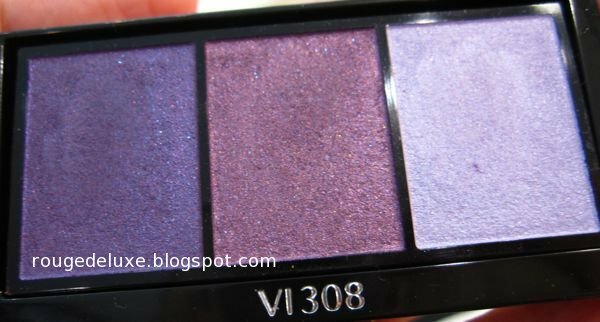 There are three new Luminizing Satin Eye Color Trios (S$51). Below is BR209 Voyage. 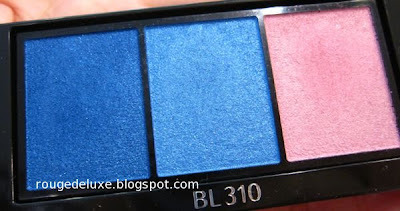 BL310 Punky Blues is a stunningly vibrant combination, and refreshingly different for a Japanese brand. My favourite was naturally VI303 Bouquet. The swatches below were done without any primer underneath. Another highlight of the collection is the new line of Shimmering Rouge lipsticks (S$43) which give your lips a glossy semi-translucent finish. (Click to view the pics in full size.) 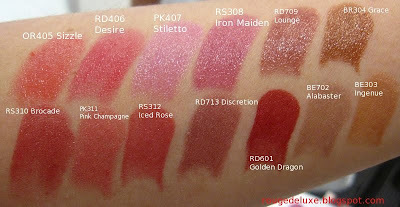 RS308 Iron Maiden is the shade used on the model in the ad visual. RD601 Golden Dragon is the most pigmented shade in the range and it is apparently selling very well. 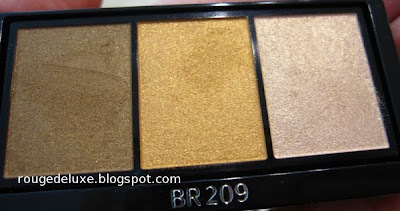 The collection also includes a new Bronzer (in 3 shades) and Smoothing Lip Pencil (in 10 shades). Late April: Tocca, L'Est Rose, Nimes, X-Girl, Fred Perry, Boofoowoo Co. 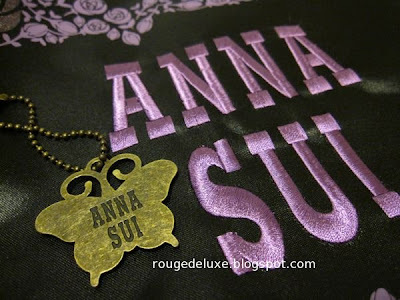 Here's a quick sneak preview of the slew of new products, including limited edition releases, that Anna Sui has lined up for March and April in Singapore! 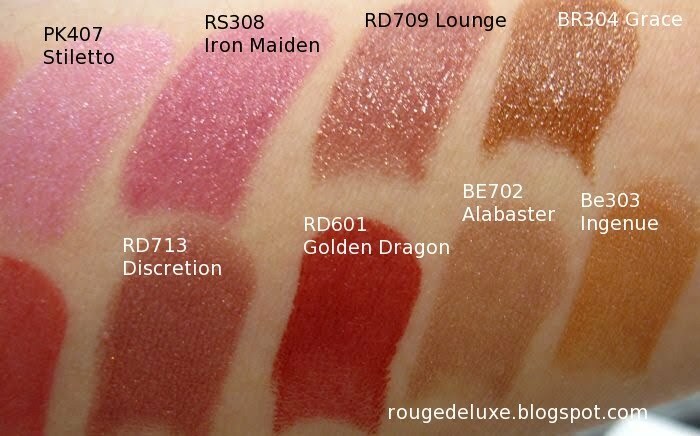 First up on 1 March is the new base makeup collection for spring. 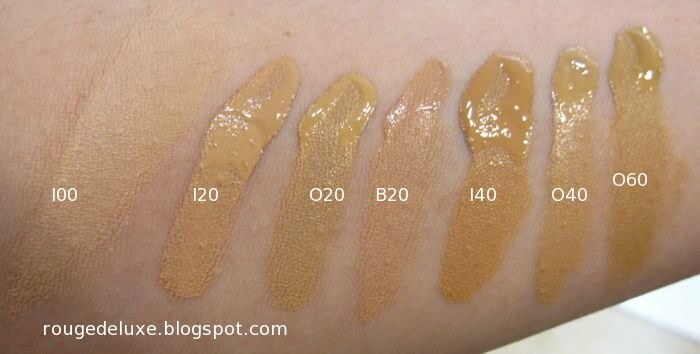 The new Protecive Foundation Primer comes in two finishes, designated "C" (for "clear") and "L" (for "long-lasting"). 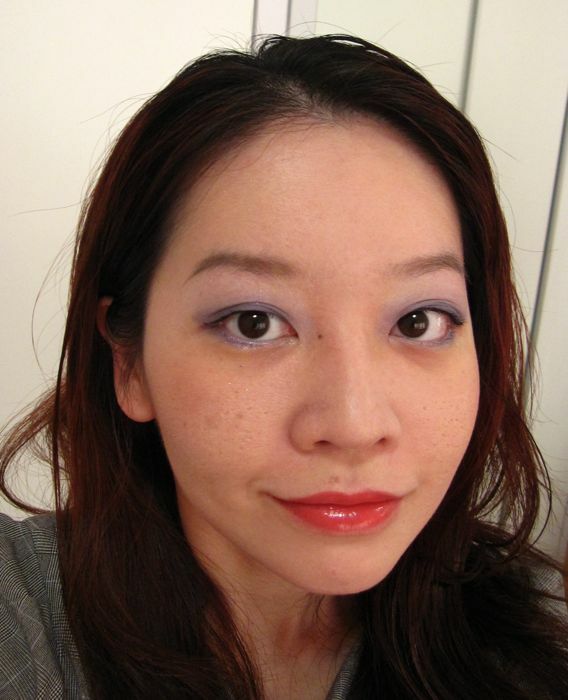 The Protective Foundation Primer C (S$49, 24ml) has SPF38 PA+++ #200 Platinum Purple helps to correct uneven skin tone. 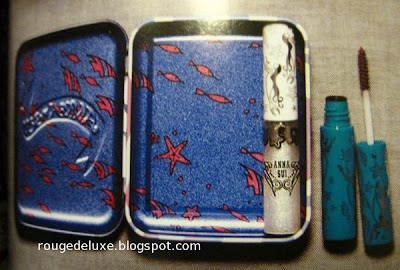 It contains "flat powder" to camouflage enlarged pores, plus subtle silver pearl particles to create glowy skin. It also provides oil control through the use of crystalline cellulose and sebum absorbing powder. The primer feels light and refreshing upon application as it contains capsules filled with water-based ingredients that burst upon contact with skin. Complementing the powder is the new Protective Loose Powder 001 (S$65, 18g) which helps to brighten up skin and give it a healthy glow with the aid of fine red and gold pearl powders. Formulated with SPF20 PA++, it contains "sliding powder" and plate-like "RFP Powder" to help create a silky smooth finish, as well as sebum-absorbing powder. 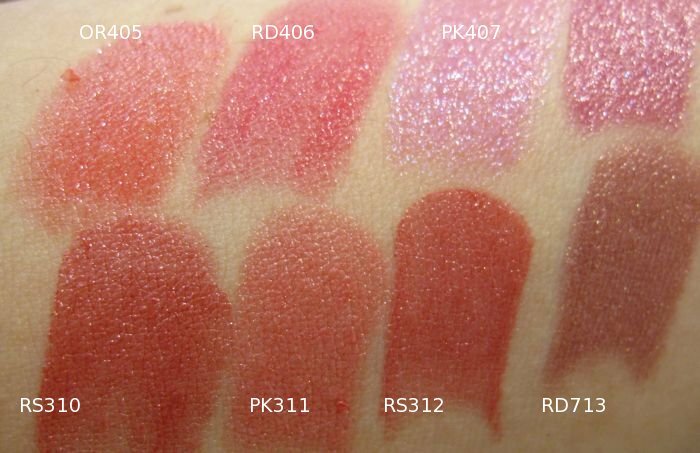 This comes in just one shade, 001 Translucent. 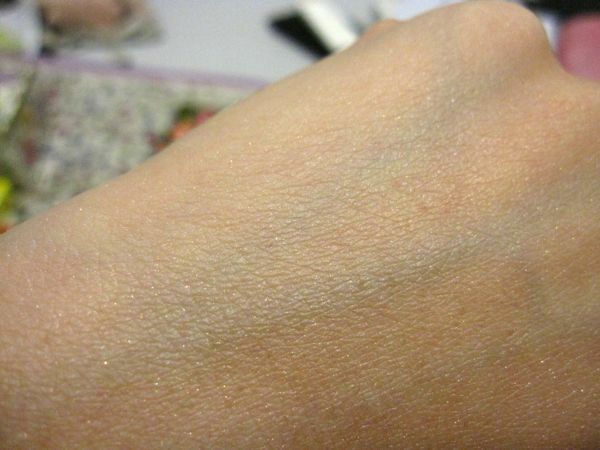 Up close, you can see the ultra fine shimmer particles. 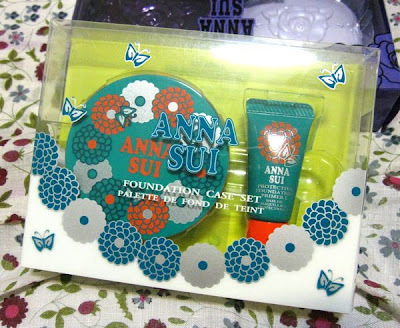 The limited edition Foundation Case Set (S$30) includes a foundation case and a sample tube of the Protective Foundation Primer L SPF38 PA++ (6.5ml/0.28oz). 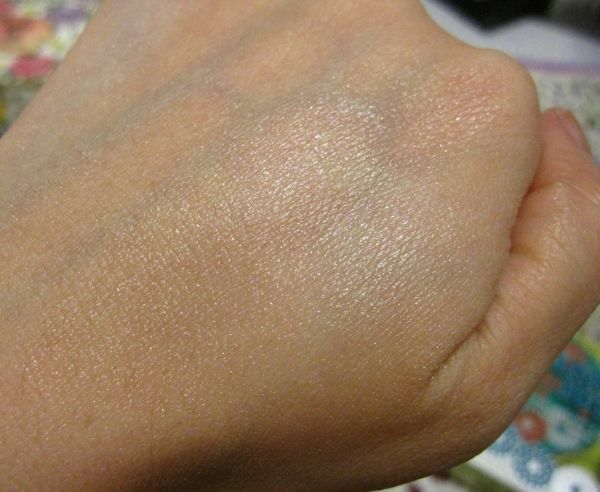 Primer L is a white cream that dries down to a more matte, clear finish whereas Primer C is slightly more dewy. 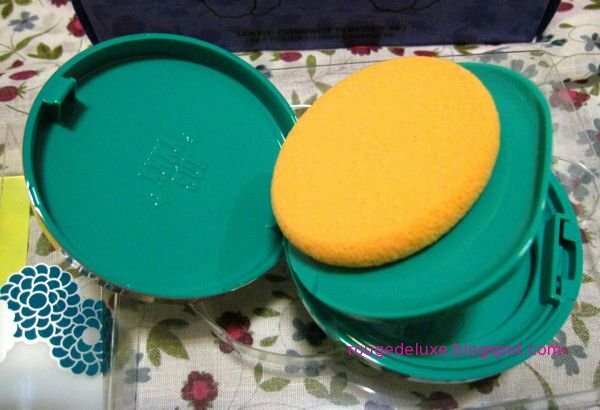 The green, orange and silver plastic case has a '70s retro feel. 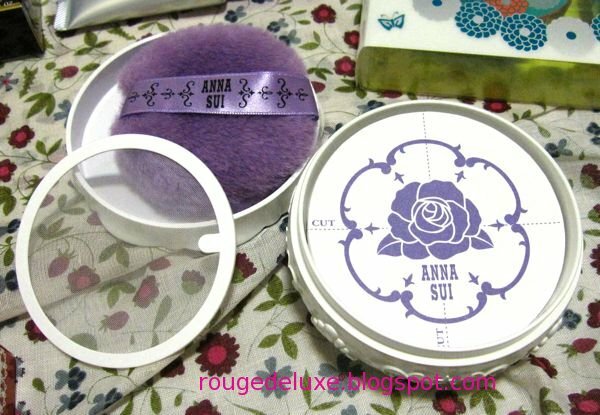 The limited edition Loose Compact Powder Set (S$91) comprises a Loose Compact Powder UV 200 SPF15 PA++ (4g) and a Beauty Mirror (Rose). 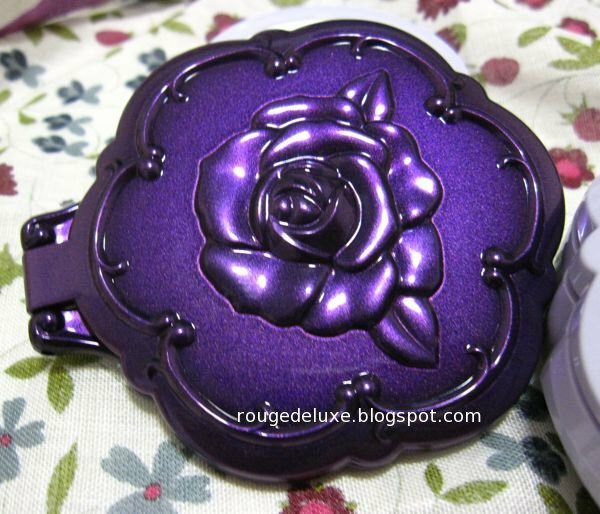 The rich royal purple hue is especially striking. 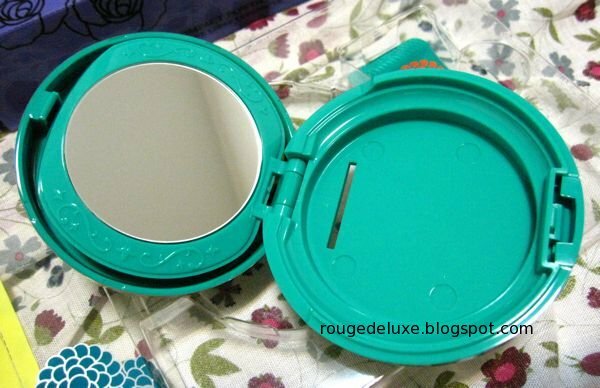 The slim lightweight compact actually has two mirrors inside, one that reflects normally and one that reflects a magnified view. I like the firm hinge which allows you to position the lid at any angle that you desire. The lid can swivel up to about a 300° angle. 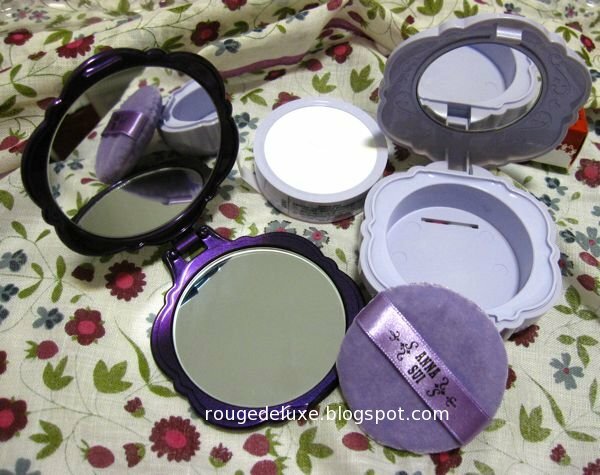 The Loose Compact Powder UV 200 is a pale lavender with micro-shimmer reflects. The shade is not new but the regular packaging is white whereas the case in this set is a matching lavender. 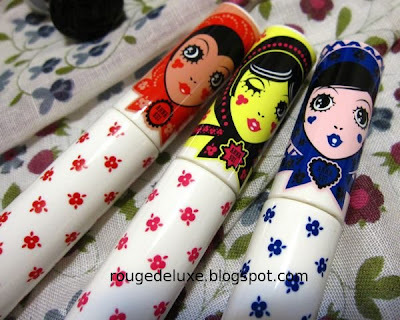 In April comes the limited edition Dolly Girl mascaras and lipsticks, which was apparently created in response to popular demand by fans of the Dolly Girl character. 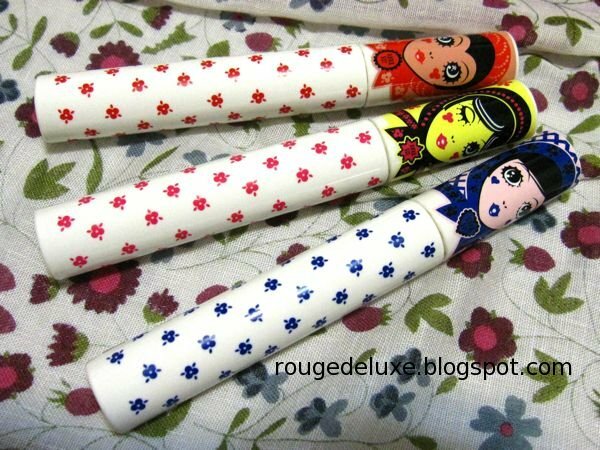 The three mascaras (7ml/0.26oz each) are all black. The red tube is Long Lash Mascara, the blue is Volume Up Mascara and the yellow is Full Mascara (Anna Sui's bestselling mascara). 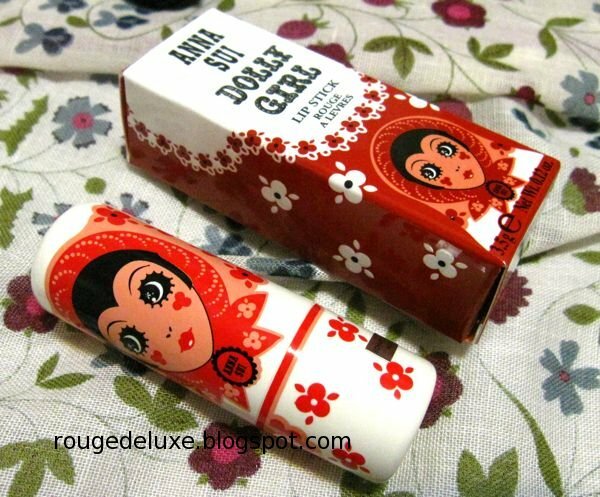 Compared to the regular Anna Sui Lip Rouge, the whimsically cute Dolly Girl lipstick (3.5g) is smaller and feels niftier, sitting ever so snugly in one's palm. For this release, Anna Sui will be giving away a tote bag with the Dolly Girl prints with purchase of S$180. Do look out for these new products at Anna Sui counters island-wide starting next week!